The T-35 is a premium Rank I Russian heavy tank with a battle rating of 1.3 (AB/RB/SB). It was introduced in Update 1.43. The T-35 has the distinction in-game as the vehicle with the most crew members (10 total). While the armour may not provide great protection against enemies even at Rank I, the large crew count makes up in part for the tank's survivability in combat. The T-35 is large. It has five turrets on top too, but only three should be taken into consideration, the one in the middle, the one front right from middle, and the one bottom left from middle due to the armaments able to destroy tanks. 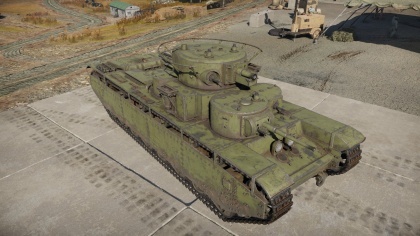 However, don't be deceived by its size, the T-35's armour are barely more than 30 mm thick, so even with a Rank I standard gun, you may be able to penetrate its armour. Despite the huge ammo reserve for the secondary turrets, the total ammo is split between the two turrets. This means that if one 45 mm cannon fires more than the other, it will run out and be unable to fire until resupplied. The T-35 is the largest tank among the Rank I vehicles. With a multi-turreted platform of two 45 mm cannons and one 76.2 mm cannon, the tank could combat enemies at an almost 360° angle. However, the armour is quite thin for a vehicle of its size so one should not play this vehicle like a typical heavy tank later in the tier line. Though, the speed is decent for a vehicle of its size, so it is possible to catch the enemies off guard by attacking from an area they least expect. Ammo racks of the T-35. Possible to run out of ammo for one secondary turret if used too long. The T-35 concept began from the OKMO design bureau of the Bolshevik Factory in 1930, when work began on a heavy tank. Two teams were made for two competing designs, one was headed by German engineer Grotte and the other was headed by N. Tsiets. Grotte worked on a 100-ton four-turreted TG-5 tank, armed with a 107 mm naval gun, using pneumatic servo-controls and suspension, but this was cancelled. N. Tsiets worked on a design that may be inspired by the British tank design Vickers A1E1 Independent, which is a multi-turret tank using one main turret with a gun and smaller ones housing machine guns. This tank may also be the inspiration for the Soviet T-28 medium tank. The development was completed with a prototype by July 1932. The prototype was about 35 tons, had a 76.2 mm main gun and four smaller turrets around it, two with a 37 mm gun and two with machine guns. There were many defects with the transmission design and the design was considered too complex for the manufacturing process, plus it was expensive. Work stopped for a simpler prototype to be produced. This simpler version had a new engine, gearbox, and an improved transmission over the previous prototype. A standardization on the turrets between the prototype and that on the T-28 medium tank was utilized so the small machine gun turret are the same between the two designs, the main gun turret was also nearly identical, but the one on the T-28 has a rear-facing machine gun. The design was approved for production on August 11, 1933 and was produced at the Kharkov Locomotive Factory with about 20 units produced. The tank was upgraded again from experiences of the two prototypes, the chassis was made longer, the hull redesigned, and 45 mm gun turrets from the BT-5 light tanks used instead of a 37 mm gun. This was designated the T-35 Model 1935 and started production on 1935 and had 35 units built by 1938, with small improvements made throughout its production life. A final redesign made in 1938 had new turrets with sloping armour installed and modified side skirts for protecting the idler wheel, six of these Model 1938s were produced. The total production run from 1933 to 1938 produced a total of 61 T-35s for the Soviet Union, its high cost being the deciding factor that ended its production. A variant produced from the chassis was a self-propelled artillery mount called the SU-14, but only two were made and never reached production stages. The T-35 is the only five-turreted tank to ever enter production. The main turret in the center and mounted high is equipped with a 76 mm KT-28 cannon, two secondary turrets mounted front right and back left had a 45 mm 20-K gun, and two more secondary turrets on the front left and back right had a 7.62 mm machine gun. Despite being a rather large tank, the interior was quite constricted for its crew. The crew of 11-12 men were crammed together and this directly affected their combat efficiency. The crew layout was a compartment for the driver, each machine gun turret had one man, two man in the turret with 45 mm guns, and three man in the main turret. It was typical for a couple crewman to serve outside the tank. A senior driver was responsible for the transmission and running gear. While a mechanic overlooked and took care of the engine. Construction of the T-35s armour was a mix of welds and rivets. The tank was powered by a 12-Cylinder Mikulin M-17M engine generating nearly 500 hp and was considered under-powered. The design had many reliability issues and even flaws, such as the main turret able to render escape hatches on the smaller turrets unable to be opened due to its gun mount. The T-35 was issued to the 5th Separate Heavy Tank Brigade in Moscow and was involved in parades through the Red Square from 1935 until 1940. The T-35 was there to impress spectators as well as foreign observers rather than as a fighting piece. In June 1940, the T-35 was subjected to either be withdrawn from front-line duties, be converted into self-propelled artillery, or be sent to military academies for future studies. It was decided to keep them for combat purposes and the T-35s were issued to the 67th and 68th Tank Regiments in the 34th Tank Division in the 8th Mechanized Corps in the Kiev Special Military District. The T-35 then saw action against the German forces when Operation Barbarossa was commenced. Though the tanks actual combat history is not very well documented, the tank regiments they were assigned to reported a loss of 90% of the vehicles, more to mechanical failures than to enemy combat. These broken down tanks were subsequently destroyed by their crews to avoid capture. The last reported use of these tanks was during the Battle of Moscow, where two T-35s were deployed and its performance went unrecorded. One such vehicle was captured by the Germans and sent to the Kummersdorf military proving grounds for evaluations. This captured T-35 may or may not be the same one the German used during the Battle of Berlin in April 1945. 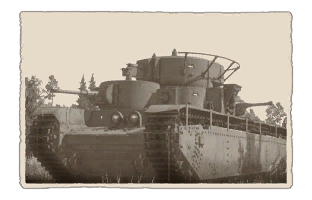 The T-35 was once mistaken for taking part in the Winter War against Finland, this is due to the deployment of the SMK, T-100s, and KV-1s prototypes into the battle as combat testing. The SMK was disabled by the Finnish and was documented in photographs, which the German intelligence designated it as the T-35C, despite being not any way related to the T-35 tank. Today, only one T-35 is left not only in an intact state, but still in running condition. This tank is held in the Kubinka Tank Museum at Moscow and only survived because it was used at a training facility rather than combat use. Kubinka also holds the second prototype of the aforementioned SU-14 self-propelled artillery gun. 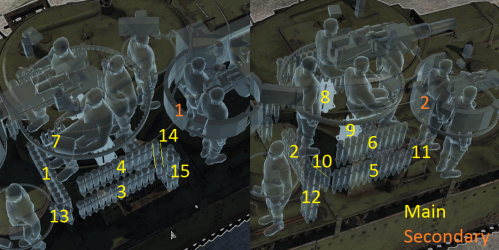 All the turrets shown on the T-35. The main turret is at center, the secondary turrets with cannons are on the top left and bottom right, and the machine gun turrets are on the top right and bottom left. Working T-35 Tank at Kubinka! This page was last edited on 13 January 2019, at 21:27.